FRUSTRATION is being voiced this week as work on the Ennis South Flood Relief Scheme seems unlikely to begin for some months yet. Hopes that the work on the €4.7 million project would get underway in the middle of the year have already long been dashed. In a statement, Clare County Council stated that the matter is currently with the Office of Public Works (OPW). It is understood that work may not start on the project for another 10 weeks. Former Sinn Féin local and general election candidate Noeleen Moran contacted The Clare Champion this week after receiving a number of documents relating to the scheme under Freedom of Information. These indicate that it had actually been hoped work on the project would get underway as far back as two and a half years ago. In a statement, Ms Moran said, “Such a lengthy delay is unacceptable. We are continuously being fed a line here by the department. This scheme has come about as a result of severe flooding in 2009. It’s now eight years on and a sod hasn’t been turned, despite all the announcements. She claimed that announcements on the project have not been backed up by any action. 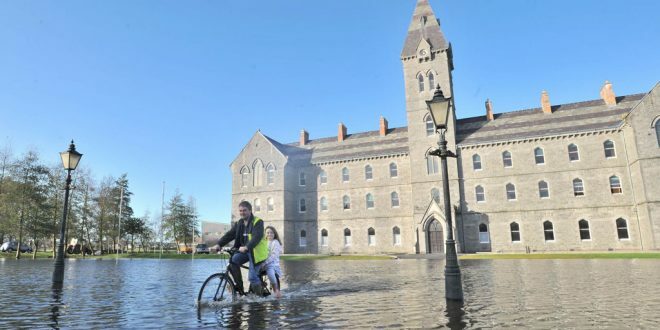 It is now almost eight years since Ennis was overwhelmed by extreme levels of flooding and Ms Moran has called on the county’s TDs to keep applying pressure. The flooding that hit the town of Ennis in 2009 will hardly be forgotten by anyone who was in the town at the time. Many homes and businesses had to be abandoned due to the extent of the flooding, causing huge public distress. Works proposed under the Ennis South Scheme include a flood overflow culvert from St Flannan’s Stream to the Clare Abbey flood plain, a flood overflow culvert from Ballybeg stream to the Clare Abbey flood plain and the upgrade of the existing flood defence embankment between the Quin Road and the Clarecastle tidal barrage, including rehabilitation and construction of sluices. Tags CClareabbey clare county council delay Ennis South Flood Relief Scheme flooding Noeleen Moran opw St Flabnnan's.